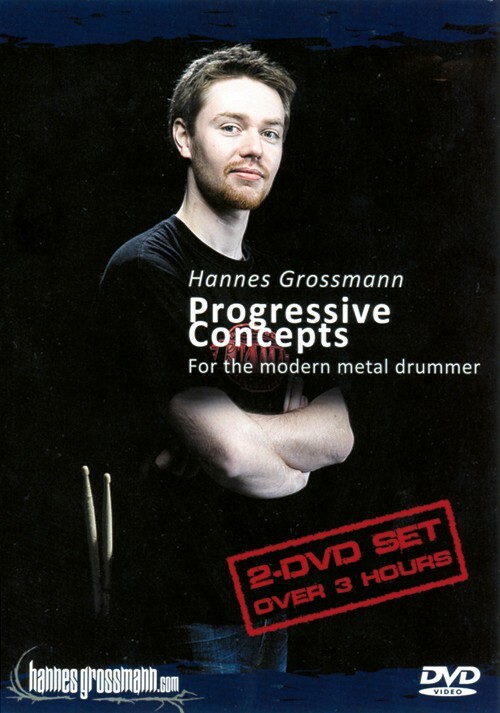 “Progressive Concepts for the modern metal drummer” is a 2-disc set DVD and features almost 4 hours of material. It was written, produced, edited, cutted and filmed all by Hannes Grossmann himself, so the whole product is 100 % handmade. The DVD is available at www.hannesgrossmann.com, at OBSCURA live shows and at the official Obscura online store (coming soon). The price is 19,99 €. DVD 1 features chapters on hand technique, foot technique, speed & endurance. There are certain practise methods Hannes shows that will drastically increase your speed and endurance. Hannes used and developed those methods himself during the prepartions for Necrophagist’s ‘Epitaph’ album, for which he was able to increase his hand speed for single strokes from 200 bpm to 240 bpm within 5 months. Disc 2 features phrasings and groove concepts that can be used for all kinds of music. The concepts are about the musical use of blast beats and how to use phrasings and accents from different genres, i.e. latin music, that can be integrated in blasts. Hannes deeply explains how to get started with odd-time signatures and how to modulate odd time phrasings, but also gives a precise insight into advanced double bass grooves and how to phrase metal fills. Both Discs feature a lot of music performances from Obscura, Ron Jarzombek and others, as well as drum solos (they appear from time to time within several chapters – there’s also one main 15 minutes drum solo that will hopefully entertain a lot of other drummers). The lessons on this DVD are mostly basic methods and general concepts, which makes the DVD become helpful for beginners, intermediate and advanced drummers – the exercises are highly practical but also very general, so on whatever stage you’re at, it will help you to increase your drum skills…but also entertain you!